Outstanding quality and versatility come together in convenient all-in-one, professional Santamedical aneroid sphygmomanometer kit. Taking a patient’s blood pressure is one of the most frequent tasks preformed throughout a medical career and home health use. Actual measurement is essential in classifying the precise degree of hypertension and determining the correct treatment. 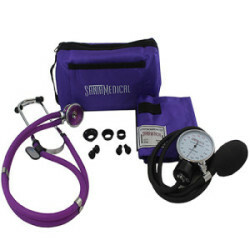 Built to last, the Santamedical aneroid sphygmomanometer kit features a modern design to fit perfectly in the right or left hand. Combined with the easy release deflation valve, this kit makes taking accurate blood pressure measurements easy and comfortable.